The average American spends more than 10.5 hours a day on digital devices like computers and smart phones, so is it any wonder our eyes are tired at the end of the day? We're actively using them to look at small print from a lit screen for over 60% of our waking hours! If you are a contact lens wearer, you may have noticed that your eyes feel more tired when you wear contact lenses than when you wear your glasses. This is not in your head - it's a scientific fact. Because contact lenses physically sit on your eye, the amount of work and energy your eye muscles use to focus on near objects (like computers and cell phones) is greater than when you wear glasses that sit a few millimeters off your face. In eyecare lingo we call this accommodative demand: the amount of work muscles have to do to focus up close. 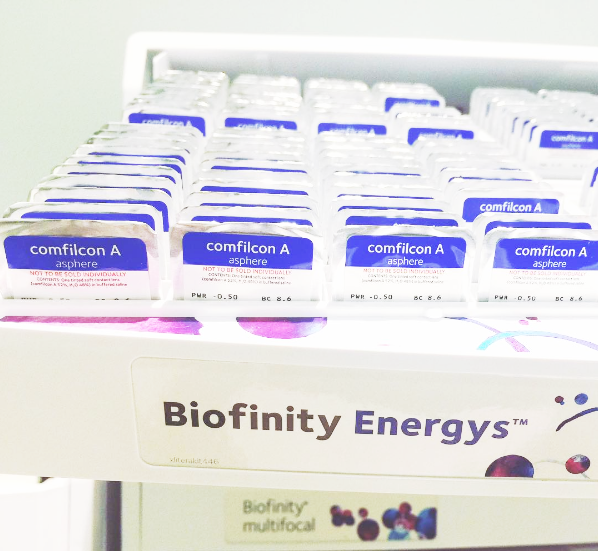 But happy contact lens wear is not lost; meet Biofinity Energys. Biofinity Energys is a new monthly disposal contact lens designed with aspheric optics to reduce the accommodative demand on eyes as they focus on near work. Their proprietary Digital Zone Optics design is not a multifocal so there are no rings, halos, or glare side effects and there is no specific "reading power" in the contact lens. Instead the power profile of the contact lens changes to match the curvature changes of the eye, ensuring your eye gets an even power grid across the entire contact lens. That's a lot to digest and even eyecare professionals can get a bit lost in understanding what's happening in this lens, but it all starts with understanding what aspheric optics really means. Let's start with some basic optics. Our cornea is curved, so when light enters the eye it immediately gets distorted or bent by the fact it passed through a curved plane. The result is the object you're looking at also looks curved (even if it's not). This is called spherical aberration - the distortion to vision that occurs simply as a result of the fact our eye is a curved sphere and not flat. When we are born, our body is set up to help negate this inherent visual distortion caused by the cornea by offsetting it with the curvature of the lens. The cornea has what's called positive asphericity (it's more curved in the center, and flatter in the periphery), and the lens at birth and through childhood has negative asphericity. But the lens is one of the few body parts that never stops growing, adding layers and thickening with every year of life. At some point in adulthood, the lens changes over from negating corneal asphericity to becoming an added source of positive asphericity itself (much more thick in the center than in the periphery). That's why adults usually feel like they see more glare and halos (especially with high demand visual tasks like night driving) than they used to. The lens is thicker, and it's now adding to the distortions that are created by the cornea! 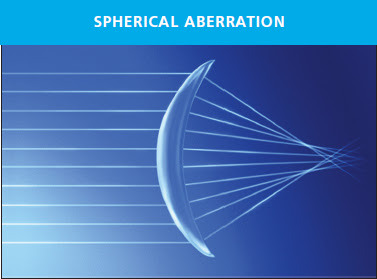 Knowing that we have spherical aberration-caused visual distortions inherent to the eye itself, CooperVision has mapped out the "average" cornea and designed a contact lens to negate the spherical aberrations that are naturally present. The power profile of the contact lens will change gradually from the central cornea to the peripheral cornea to match the bend and curvature change of the average corneal shape. The result is a lens that's designed to correct your vision perfectly at each point of the contact lens -- not just a -4.00 throughout the whole lens like most contact lens designs, but a -4.00 right in the center and then maybe a -3.93 right outside, and a -3.87 out at the periphery for example. The goal is that your eye gets only the correction it needs at each point in space, and not more correction than necessary, which would increase the amount of work your eye has to do when looking at something up close like a cell phone or computer (the accommodative demand). This is the concept behind Biofinity Energys -- there's no bifocal; there's no reading power. Just a lens designed to match the average cornea's bend to negate any optical distortions that would make the eyes have to work harder to see. If you are an astute reader, you may have noticed there are some potential shortcomings of this design. It does assume an "average" cornea, so if your cornea is far from average then you may not get any visual benefit, or potentially even feel like vision is worse (though you'd have to be pretty far off from average for this). Some people will notice a vision difference (presumably those that are very average), and some people may notice nothing at all with an aspheric lens design. 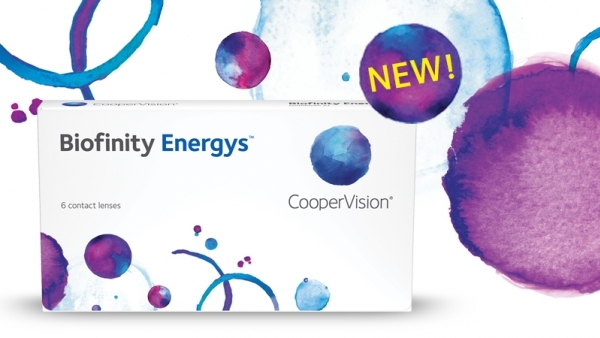 CooperVision reports from their own study that 8 out of 10 digital device users (using devices at least 4 hours a day, 5 days a week) report Biofinity Energys made their eyes feel less tired. Some doctors have tried to use aspheric contact lenses to mask low amounts of astigmatism, There is data to support this! A 2004 study comparing aspheric contact lenses to spherical contact lenses (in this case CooperVision's Frequency 55 lenses) found that aspheric optic designs can mask 66% of the astigmatism in patients with an average astigmatism amount of 0.69D. If your patient has -0.75D of astigmatism or more, they'll likely need a toric lens for statistically significant improved visual correction, but for low astigmatism amounts there is evidence you can mask over half of it with an aspheric design. Spherical lenses only masked 21% of low amounts of astigmatism in the same study. The key to fitting success with Biofinity Energys is to understand what the lens does and what the lens doesn't do. It won't give a reading boost to people needing reading glasses. There is no reading power anywhere in this contact lens. But if you have teens, millennials, or even pre-presbyopes that aren't needing reading glasses yet but are feeling end of day eye strain and fatigue, this lens is a perfect recommendation. Patients usually won't see any differently reading letters on a chart, but how their eyes feel when they adjust to look up close - that's what the difference will be if they are having issues with eye fatigue in their previous contact lens brand. "Mr. Jones, you told me your eyes were feeling really tired at the end of the day. There's a new contact lens design I want you to try that can relieve some of the strain on your eyes when you're looking at computers or your phone. Most people don't notice that they see any differently, but how your eyes feel at the end of the day -- that's what this lens can improve. 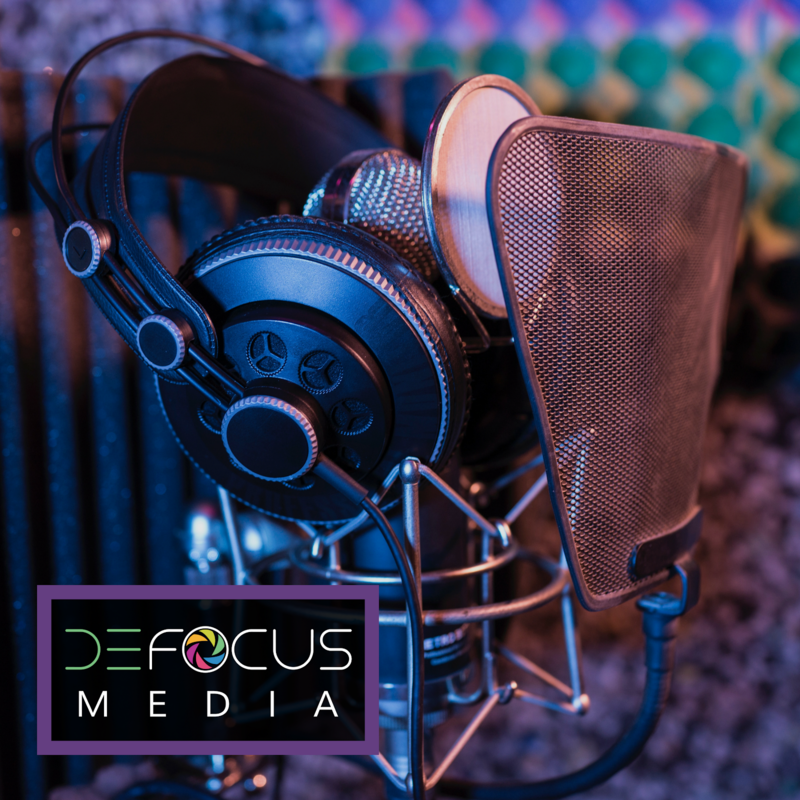 I can keep your vision clear and sharp like what you're experiencing in your lenses right now, but just help them work less as you go through your day." I'd love to hear your feedback on the lens! Please comment below if you've tried it out or what your patients are saying! Want to learn more? Check out my podcast with CooperVision's Dr. Michele Andrews! I wear the regular Biofinity lenses and am wondering if the Energys lenses are worth a try. I'm on the computer a lot, and my phone a fair bit, and I do get tired eyes, but I'm wondering if it's just from screen over-use or if the problem can be helped with the contacts. Opinions? I'm hopefully going to be trying these! I wear Biofinity lenses already, and I love them, but these sound awesome!! I'm always on a screen, so my eyes definitely do tire!! This lens was made for you! I'm really liking them so far! Definitely seemingly far less tired eyes, and easier time going from focusing on something close up to something further away. Same comfort level as the normal Biofinities for all day wear, and even napping in them is fine as well. They may cost more, but I think they're worth it. Wearing these as a trial now. Love them! I'm like a -7.35 and -7.50 Oasys killed my reading vision (blurry). -7.25 Air Optix killed my distance vision (blurry). -7.50 Energys perfect reading and distance vision. Can't wait to order them on Wednesday. I had just gotten my eyes examined the other day, and they still have me at the -1.25 in both eyes for all the brand contact lenses I use. I've mentioned to them about how my Biofinity and Biofinity Energy's seem to cause my eyes to take a little extra time to focus on distant objects after looking at something close up long enough, compared to my Focus Dailies, which seem to give me the best overall distant vision which I really like! I do really like the Biofinity and Biofinity Energy lenses tho in terms of there overall comfort with my eyes, but I'm not so sure why they seem a little less sharp for my distant vision than my Focus Dailies are tho. I've even come across that with some other brand lenses I've tried too. I asked if they can maybe up the power in my Biofinity and Biofinity Energy ones by a step to like -1.50 in both eyes, and they wouldn't tho unfortunately, cause they claim that whatever they test our eyes at in the Phropter, that's what each lens should be at. My question is, is that typical to have slightly different visual acuity experiences in different lens brands, even with them all being the same power? And shouldn't they not mind trying us at a step higher in the power for the ones that we're telling them about that aren't giving us as sharp of vision too? Cause isn't it kinda like clothes in a sense, since each one in the same size might not all fit exactly the same even if for instance u usually wear a Large in most? So kinda how it would be for contact lens Rx powers too I would imagine. Or maybe they just have a standard they like to stick with when it comes to contact lenses and how in theory, if we're at a certain power, that means they should all perform about the same in terms of the visual acuity, since their meant for the same purpose. I know I def. want to keep my Biofinity and the Energy version tho, cause I do really like how the material feels in my eyes! The're so nice and light overall! :) Any suggestions on how I can sharpen my vision a little more in those tho, as I'm someone who needs good crisp distant vision also with all my brands I use. Generally speaking, power is power. It's math. It's Optics. It's not clothes making. There are exceptions to this rule, but there are many many other factors that go into how you see out of the contact lens than the power. No offense intended, but most patients don't quite understand this. Increasing the power does not necessarily make your vision better. However given all that, there is a subset of people that do not see very well out of an aspheric contact lens. Without going into a lot of details about spherical aberration and the eccentricity of the cornea, there are certain number of people that have what you might say and opposite amount of eccentricity or spherical aberration than the average. For these people, wearing an aspheric contact lens can actually make their distance Vision that worse, not better. Myself, an optometrist, is one of these people. And I have come across quite a few patients throughout the years for the exhibit the same symptoms. Every aspheric contact lens I've tried, has worsened by Vision, rather than improved it. Unfortunately, most optometrist don't know this because they haven't read the small amount of reports in the literature, were bothered to investigate the reasons. They simply just try the patient in another lens, and it works. But they never really find out why. Very good point! Aspheric optics assumes you have an "average" cornea, but if you don't it may either do nothing, or could even worsen your vision if you just so happen to have corneal and higher order aberrations that are exactly opposite of what the lens aims to correct!